How do I know if I have Full Tort or Limited Tort? If you don’t know whether you have “full tort” or “limited tort” insurance, there are a few different ways you can find out. The easiest is to call your insurance agent or a personal injury lawyer and ask. While you’re on the phone, ask your agent to provide you with a copy of your “declarations page.” This is what insurance companies call the summary printout that lists all the information about what coverages you’re paying for. 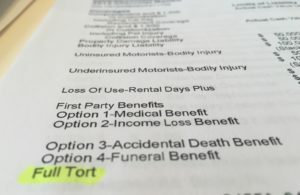 If you have “limited tort,” ask your agent to change it to “full tort” right away. If you’ve been in an accident and have limited tort insurance, our Pennsylvania Car Accident Lawyers can still help and try to find a way around it! Am I entitled to compensation for Pain and Suffering if I have Limited Tort? Whether or not you’re entitled to “pain and suffering” in Pennsylvania is a complex question you need to talk to a lawyer about. If you have “limited tort” insurance, the question is even more complex. If you elected “full tort” insurance and sustained an injury, you’re entitled to be compensated for your pain and suffering. The harder question is how much is your pain and suffering worth? As injury attorneys, we are extremely good at determining how much your injuries are worth and making sure the insurance company compensates you fairly. If you elected “limited tort,” you’re not necessarily out of luck; the answer is “maybe.” There are a number of exceptions to “limited tort” it takes a professional to navigate. When you hire us to represent you, if you chose “limited tort” insurance, we’ll perform an in-depth investigation into how we can best convince the insurance company that you need to be fully compensated for your injuries, including your pain and suffering. If you were injured in an accident in Pennsylvania and have elected “limited tort” insurance, you might not be entitled to compensation for your pain and suffering, which can substantially diminish the value of your claim. With “limited tort” insurance, you are limited to being reimbursed for your “economic” losses, which includes out-of-pocket expenses, like medical treatment, lost wages, and property damage. With “limited tort” insurance, though, you aren’t necessarily out of luck. Our firm frequently has success fitting cases into one of the statutory exceptions and convincing insurance companies (or juries, if your case doesn’t settle) that you should be entitled to compensation for your pain and suffering. The most widely utilized, yet hardest to understand exception to “limited tort” is for “serious injuries.” If you sustained a serious injury, you might be entitled to compensation for your pain and suffering. Just because an injury is serious to you doesn’t make it serious to the Court. It’s incredibly important to retain an experienced personal injury attorney to help build your case. This is a simple exception. If the other vehicle involved in your accident was registered outside of Pennsylvania, you aren’t bound by your “limited tort” election. If the person that hit you was intoxicated at the time of the collision, you might not be bound by your “limited tort” election. In order for your “limited tort” coverage to not apply, however, the other driver needs to actually be convicted of a DUI or accept ARD. If you are driving or riding in a commercial vehicle, a company car or in a form of public transportation, your limited tort coverage doesn’t apply. If you are hit while riding a bicycle or while walking as a pedestrian, you are not bound by your “limited tort” election and may recover for your pain and suffering. While not an “exception,” per se, motorcyclists are not bound by their limited tort elections on their car insurance. Injured motorcyclists are always entitled to seek compensation for their pain and suffering. Will a lawyer take my case if I have Limited Tort? At Bernard Stuczynski Barnett & Lager, we take limited tort cases. Unlike some of the “mills,” we don’t turn down cases simply because the injury victim made the mistake of electing “limited tort” insurance. We look for exceptions and we’re not afraid to file suit to prove our client’s injuries were serious and worthy of an award for pain and suffering. If another attorney turned down your case because you have limited tort insurance, call our office today at 814-452-6232 for a free consultation. We’ll do our best to see if we can help.